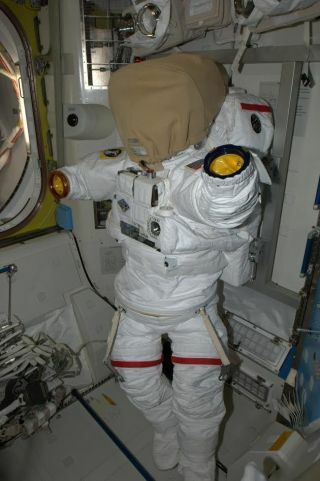 NASA astronaut Rick Mastracchio posted this image of a spacesuit inside the Quest airlock Tuesday (Dec. 17) via his Twitter account, @AstroRM. A problem with the International Space Station's cooling system will require a series of spacewalks to fix, pushing the planned Thursday (Dec. 19) launch of a private cargo spacecraft into next month. NASA has decided that three spacewalks — one each on Dec. 21, Dec. 23 and Dec. 25 — will be necessary to replace a faulty pump module on the orbiting lab. The holiday spacewalks will postpone the first contracted cargo mission of aerospace firm Orbital Sciences' unmanned Cygnus spacecraft until mid-January at the earliest, NASA officials announced today (Dec. 17). "NASA astronauts Rick Mastracchio and Mike Hopkins will remove a pump module that has a failed valve. They will replace it with an existing spare that is stored on an external stowage platform," NASA officials wrote in a press release today. "The pump is associated with one of the station's two external cooling loops, which circulate ammonia outside the station to keep both internal and external equipment cool." The valve malfunctioned on Dec. 11, requiring the shutdown of some of the space station's support systems. The issue — which NASA officials say does not endanger the lives of the six astronauts aboard the orbiting lab — initially pushed back the planned Cygnus launch from NASA's Wallops Flight Facility in Virginia by 24 hours, to Thursday evening. Orbital Sciences' Cygnus spacecraft is attached to its Antares rocket on Dec. 10, 2013 for a planned Dec. 19 launch to deliver cargo for the International Space Station. But that delay now may be a month or more. "The Antares rocket that is currently on the launch pad at Wallops Island, Virginia, will be returned to a horizontal position and transported back to the Horizontal Integration Facility (HIF)," Orbital Sciences officials wrote in a press release today. "At the HIF, the Antares payload fairing will be removed to allow the Cygnus team to open the payload module hatch and remove time-critical payloads for safekeeping until the next launch attempt, which will occur no earlier than January 13, 2014," they added. Virginia-based Orbital Sciences holds a $1.9 billion NASA contract to make eight supply runs to the space station using Cygnus and Antares. Cygnus has visited the orbiting lab once, on a successful demonstration mission that blasted off in September. Another company, California-based SpaceX, signed a $1.6 billion deal with NASA to make 12 cargo flights to the station using its robotic Dragon capsule and Falcon 9 rocket. SpaceX has completed two of these contracted supply runs already, and the third one is slated to lift off early next year.